Higher education isn't the only realm where some members of the rich and famous seek out advantages to benefit their kids' education. According to a new study conducted by a pair of researchers from Duke University and the University of Florida, "affluent and more educated families" are best positioned to take advantage of data available in public websites that offer K-12 school ratings. The "unintended consequence" is less equity in education. The U.S. Census Bureau for data on racial and ethnic composition and educational attainment by zip code. Beginning in 2003 GreatSchools, a nonprofit, expanded its ratings beyond its original state (California) to encompass 100,000 public schools across the country, covering some 20,551 zip codes in all 50 states. The goal of the research was to see how this roll-out "accelerated or slowed the inequality in the home prices as well as the economic character of communities," according to a working paper on the project. 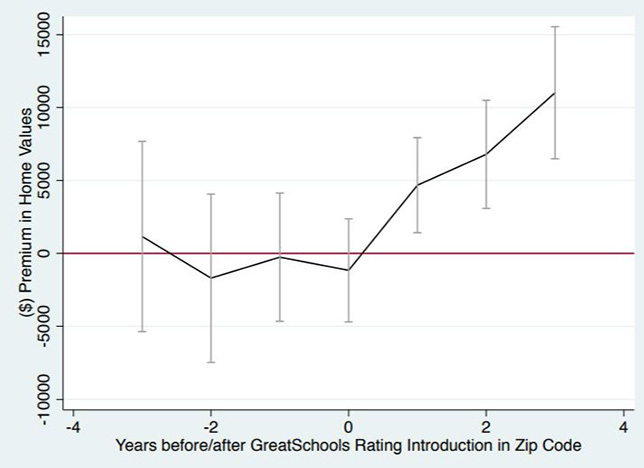 On the economic side, the researchers in their "most conservative model" found that housing prices for zip codes where the schools were rated two standard deviations apart in school performance diverged by nearly $9,000 after four years of the information being made available. They also found a link between rating availability and the proportion of top income earners in a zip code, as well as growth in the White and Asian populations within communities. As the researchers wrote, "We show that broader access to information increased segregation because high-income families could more readily leverage school ratings to move to neighborhoods with better schools. In this case, knowledge was indeed power, but for the powerful." As a result of the shift in home values, Hasan and Kumar predicted that higher-performing school districts would continue experiencing "an increase in higher-income and college-educated households, with more residents who are White or Asian," compared to those that are African-American or black and Latino. They also would expect "higher rates of in-migration for communities where ratings are available for desirable, high-performing schools." What's ironic, noted the74million in its coverage of the report, is that GreatSchools originally was intended to help parents — "especially low-income parents" who might lack "the time and social connections to consider all the school options available to them" — to make good decisions about where to enroll their children. What's actually happened, the report pointed out, is that "rating availability accelerated the divergence across American communities." For its part, in 2017 GreatSchools began to evolve its ratings away from a strict emphasis on student test scores, student progress or college readiness data and to also include additional factors, such as how much the school helps student improve academically; how well it supports kids from different socioeconomic, racial and ethnic groups; and whether or not groups of students are "disproportionately affected" by discipline and attendance policies, as a ratings explanation on the site explained. To round out the numbers, the site also allows people with direct experience with a school to add their own comments. A copy of the working paper, which has been submitted for peer review, is available on the personal websites for Hasan and Kumar.